I've been making cheese in my kitchen at home for over two years now. It is much easier than most people think to get started, which I love, but it can also be really detailed and complex to get the best flavours from your cheese... and so my experimenting and learning goes on. One camp says that, by definition, vegan cheese isn't cheese because it doesn't use 'real' milk. The other argues that ​vegans have the right to enjoy cheese in their diet just like anyone else, especially if a convincing alternative to dairy can be made at home. With a vegetarian wife, a vegan friend and a love of cheese, I fall firmly into that second camp. Cheese is one of the biggest barriers to people trying or staying on a vegan diet. In 2012, the average American ate more that 33 pounds of dairy cheese. It's an unavoidable part of meals at restaurants; those that offer a vegetarian option usually only offer one based on dairy cheese. Let's be honest - dairyless cheese previously had a poor reputation and for good reason. If it could be found in restaurants or stores at all, it was nutritional but not much else. Vegan cheese substitute generally had one waxy texture and, though it claimed to come in multiple flavors, all you could really taste were soy and salt. It didn't taste or melt like the dairy cheese it was supposed to replace. Soy milk is perhaps the most popular of the three because of its neutral flavor and smooth texture. Almond milk and cashew milk have pleasant, sweet flavors that make them ideal for cheese and both nuts are readily available. Pretty much any nut that will emulsify into the right consistency can work, though. Hazelnut cheese, macadamia nut cheese, and even pine nut cheese are all possibilities. 24 hours before preparing the milk, soak the nuts in cold water. Remove them from the water when ready to use. Place all of the ingredients in a food processor or blender. Blend until smooth, which will take 4-5 minutes. Raw cashews already come ready to use, but raw almonds are likely to still have the skins on (although these almonds are ready blanched). While you can leave the skins in and still get almond milk as long as you follow the rest of the steps in the recipe, it won't be as smooth and will have flecks of brown which may not strain out and will probably show up in your finished cheese. If you don't want to worry about the skins, buy almonds that have already been blanched or remove the skins yourself using this simple method. Place the almonds in a shallow dish. Cover with boiling water. Let almonds sit for 5 minutes. Drain the water, rinse the almonds with cold water, and let them cool until you can comfortably handle them with your fingers. The nuts should pop out of the skins with some gentle squeezing and peeling. Rub the almonds with a clean kitchen towel to get stubborn bits of skin off. If you're in a hurry or just forget to do it, the 24 hour soaking period isn't strictly necessary. Many home cooks find that soaking makes the nut milk smoother, some don't notice any difference, especially when using it for making cheese. All of these ingredients have the same major drawback: soy and nut allergies are very common. Thankfully though, there are recipes with vegan cheese ingredients that use other bases, like oats or vegetables. Softer cheeses just need to have excess water strained out of the milk before being refrigerated to set. If you are looking to make a firmer cheese instead, the next essential building block for your recipe is a setting agent. Most recipes call for either pectin, a plant-based jelling powder that is probably already in your pantry if you do any other home canning, or powdered agar, which comes from algae. Agar is typically used in recipes for the firmest cheeses. One of the biggest problems for dairyless cheese in the past was that it just didn't taste "cheesy." Most recipes solve this problem by including nutritional yeast in the ingredients. Nutritional yeast comes in small flakes and is often used as a condiment or to directly replace hard cheeses like Parmesan in vegan pasta recipes. It gives vegan cheese both its savory flavor and adds to the amount of complete protein. The stronger the flavor of the cheese you're making, the more nutritional yeast a recipe will call for. One of the biggest benefits of making your own cheese is being able to add whatever other flavorings you want from the beginning. Fresh or dried herbs, hot peppers, sun dried tomatoes, even dried fruit are all things you can add to a vegan cheese recipe at home to get precisely the flavor that you want. To get the whole range of textures that are possible with vegan cheeses, heat, refrigeration, or both, are a must. Every recipe is different because this cheese is so versatile, but almost all recipes require at least overnight refrigeration. Like any other cheese making, making dairyless cheese needs some things you may not already have in your kitchen. Soft cheeses must be strained through and stored in cheesecloth so they lose excess water as they set in the refrigerator. Firmer cheeses need to be put in a mold to set. Silicone muffin tins work well for making small rounds and are easy to unmold. A durable food processor or blender is a must for making regular batches of vegan milk. the 5 minutes it takes to get the vegan milk to the right consistency is not a job for a blender that overheats. No one is ever more interested in how much protein you eat and where it comes from as they are when they hear you follow a vegan diet. Luckily, vegan cheese ingredients have healthy protein from both the milk substitute base and the nutritional yeast flakes that give it a savory flavor. While it doesn't provide as much protein as legumes, vegan cheese substitute is a good way to add protein and versatility to your diet. Try out a few cheese recipes. Don't give up on the whole idea if the first batch isn't to your liking in flavor or texture. Because so much more of the process is controlled by what ingredients are added than it is by biological processes, as in making dairy cheese, there's a lot of room for the home cook to experiment with dairyless cheese in a safe, fun way. Standing Stone Farms Basic Beginner Cheese Making Kit - Mozzarella, Burrata, Burricota, Chevre, Ricotta, Mascarpone & Butter! Every month I'll be rounding up the best cheese news stories from the web, blogosphere and social media. Or, rather, a much better alternative to it! On the 2nd/3rd May, there is the Melton Mowbray Artisan Cheese Festival which is closely followed on bank holiday Monday (4th May) with the World Stilton Cheese Rolling Championships in Stilton itself! The Food Festival Finder has a top ten list of UK based events to get you through the rest of the year, whoever is prime minister on the 8th of May! I learned this month that Wisconsin is the only US state to require all of its cheese makers to be licensed! ​Christopher Eckerman became the 6th annual recipient of a scholarship to start him on that very rewarding journey! ...it's raw milk cheese appreciation day! ​This story is not actually new, it was published in July last year, but the evocative writing and the beautiful photography of this stunning cheese making small holding in Italy make it a very wistful read. A cave of a different kind was harbouring this 3,600 year old mummy, complete with the world's most aged piece of cheese! Although, when you watch the video that goes with it, I'm guessing it's not a cheese you're going to want to try and make for yourself. ​"It's incredibly rude to only eat parts of the cheese that 'are not gross'!" Marcella the Cheesemonger is one of my favourite cheese bloggers. Recently she ran an inspired piece on the favourite cheese journeys of cheese professionals. Well, it's time to finish this roundup off, so how about two little bits of silliness? Here are (apparently) 14 signs that cheese​ is your one true love. I'm pretty sure none of us would expect this when ordering cheese and biscuits! Till next month...​ my cheese-making friends. *I've been unable to find the original source for this image, which has been doing the rounds on social media. If you are (or know) the copyright owner please contact adam@homemadecheese so I can give proper credit. I’ve talked about a lot in the articles on the website about the importance of making cheese in sanitary conditions. It’s probably something we’re all aware of, but when was the last time you thought about why it is so vital? Sanitisation is beyond simple cleaning. We should clean all of our cheese making equipment every time we use it (including our hands), but, to my mind, this means warm soapy water used to remove cheese or curd residues and the fats left clinging to the mould when it’s been used. However, once your equipment has been dried after cleaning, it will not be sanitised. We don’t like to think about it, but every surface in our homes is teeming with bacteria, especially the cloth you use for cleaning the work surfaces; they like the moistness of it and breed like wild fire on the supply of nutrients they can find in there! Unfortunately, those bacteria are so hardy that whilst a simple warm and soapy wash might get your equipment clean enough to put back in the cupboard after use, it is not enough to ensure safety when making your next batch of homemade cheese. There is a certain irony about sanitisation in cheese making, we focus a lot of effort in killing bacteria on and in our equipment before making cheese, but then add bacteria to our milk right at the start of our cheese making process. Of course, the distinction is that one (and only one) of those bacteria are desirable, whilst the others are most definitely not (one study found over 7,000 different kinds in one home). In the article all about milk, I talk about what a fantastic environment milk is for breeding bacteria. It is full of nutrients they can feed off and, when we’re using it to make cheese at home, we raise it to just the right temperature for the them to breed rapidly. Salmonella (diarrhoea, fever and stomach cramps, can cause death). If you would like more information and the full, scary illness details of the damage these bugs can reap, they can be found in this chart. These bacteria cause millions of infections every year in the developed world, and I would love it if none of us were to join that statistic by having impeccable hygiene standards in our kitchens. Join the homemadecheese.org community to get the free eBook 'Making Cheese at Home, A Beginner's Guide" and, coming soon, many free add-ons that will only be available to subscribers. The first step to keeping equipment sanitary is to avoid equipment ‘mix & match’, i.e. use the same tool for the same task each time. Identify a spoon that you always and only use for stirring milk and curds and don’t use it in tonight's soup or stew. Use the same tub for collecting curds and the same pan for warming your milk and creating your cheese. Avoid using the one you made spaghetti Bolognese last week. The benefits of this approach are two-fold. You remove the risk of cross contamination, i.e. taking the micro-organisms that exist in one environment and introducing them to your cheese making world. It helps keep your cheese making equipment distinct from generic kitchen equipment, which makes it much easier to keep on top of the thorough cleansing regimen you should be following. There are some very simple routines to make sure your cleaned equipment has been sanitised and rendered germ-free before cheese making with it. The two best ways of killing bacteria are through the application of certain bleach-like chemicals (do NOT use household bleach to sanitise your equipment), or through high heat, usually delivered by boiling equipment. Stainless steel equipment, such as pans and colanders as well as any food grade plastic material, like cheese presses and moulds, can and should be treated chemically. I use a dedicated sterilising agent, more commonly associated with home brew activity. I have faith in it because it is formulated specifically to sterilise materials used for making food products. It’s very easy and safe to use and there are no unpleasant bleach smells. To use it, follow the instructions on the pack. I have a little paranoia on the sanitising front and so always rinse out four times afterwards, just to make sure that any risk of flavour transfer is eliminated. Any cheesecloth I use, I sanitise using boiling water. This is because it is very hard to rinse a chemical cleaner out of the fibres, and the risk is that this will leave an unpleasant taste in the material that transfers to your cheese. It is also possible to sterilise equipment through the heat generated in an oven or dishwasher (on a hot setting). Although these seem sensible enough routes, I have never used them as my personal preference for using sterilising powder is too strong to ignore. Always sterilise your cheese making equipment immediately before using it, so that micro-organisms have no time to repopulate after cleaning. And make sure to remember that both your skin and kitchen worktop are overwhelmed with bacteria, so handle sterilised equipment only with very clean hands (I use Mrs. Meyer's Hand Soap Lemon Verbena, 12.5 Fluid Ounce (Pack of 3)) and use paper kitchen towel or fresh, clean tea towels to stand your equipment on once it is cleaned.With clean equipment, you stand a lot better chance of only cultivating the bacteria you need to make great cheese. These are the products I use for sterilising - hover your mouse over for the latest Amazon price in your location. Precision Nylon Brush Set for Cleaning Airbrushes 3.5"
A sturdy scrubbing brush that's easy to hold is essential. This will get the curd residues off your equipment. These mini brushes are perfect for getting the holes in your cheese moulds nice and clean. This sanitising powder is the final stage after scrubbing your equipment. It will leave all of your cheese making tools sanitised for the next batch. Smoked cheese has a wonderful flavour, but most bought from the supermarket has had that taste added chemically. Believe it or not, ‘liquid smoke’ is brushed onto the cheese to give it the great flavour! Your standard supermarket smoked cheese has never so much as seen a smouldering wood chip in its life. Of course, the upsides to this for mass producers are a uniform taste and ease of application, which both make it cheaper to produce. The best part is that, just like your homemade cheese, it’s an authentic smokey taste. In this article, I'm going to look at how simple it is to set up your own cheese smoker to impart the natural, delicate flavour of smoke to your own cheese. There are two ways to tackle smoking your own cheese. The first is that you can buy a kit to do it in a more controlled way (see the table below), the second is to set up your own cold smoker using household equipment. Cold smoking, as the name implies, means smoking the cheese without getting it hot... mixing heat with cheese is a requirement for cheese on toast, but you'll find it a bit disastrous for smoking! A wok/barbecue with a lid to hold the smouldering chips and create a thick, flavoursome fog! A smaller pan/bowl/pie tin that fits inside the wok over the wood chips but leaves room for the smoke to flow around it. Perfect for the beginner. This smoking set comes supplied with enough dust (think ground wood chips) for 50 hours of smoking fun - beech, oak, maple and cherry. It is used inside your bbq or other smoke container (check dimensions) and makes smoking incredibly simple and safe. It also comes with a free book on getting the most out of smoking food. If you decide to take smoking of cheese (or any other food stuff, for that matter) really seriously, then this smoke oven will take it to the next level for you. It comes complete with over a dozen accessories, including thermometer, hooks and fish baskets. It also has a viewing panel to see how well your smoking is progressing - the only question is: where will you put it? 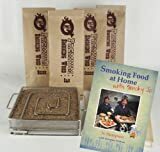 This is a variety pack of top-up smoke dust for use in the beginner's cold smoker on the left (or equivalent product). The set contains: alder, apple, beech, cherry, hickory, maple, oak and whisky oak. You can reasonably expect to achieve 16 smokings from this pack. ​Traditionally cheese is smoked with hardwood chips and there is a huge range available, either loose or made for specific smokers. The kind of chip used should be suited to the cheese you are smoking. Milder flavours, such as alder and cherry work best with cheeses like mild cheddar and mozzarella. Stronger smokes, like that produced by the infamous hickory chips or mesquite are more suited to a sharper cheese like strong cheddar or stilton. Thinking a bit wider, wood is not the only source of smoke for flavouring cheese. In the brilliant Artisan Cheese Making at Home by Mary Karlin (buy a copy), there is a recipe for tea-smoked Gruyére. The recipe calls for the smoking agent to be a mixture of brown sugar, white rice, oolong tea leaves and star anise pods showing that experimentation and our imaginations are the only limit on the smoked tastes that we can try and impart to our cheese. Now that you have everything needed to smoke your cheese, it’s time to actually get on and do it! Firstly, make sure that your cheese is ready to be smoked. It needs to be air dried in the fridge overnight and then brought up to room temperature before smoking it. Line your wok with foil, making sure to overlap the foil around the lip. In the base, put the recommended amount of smoking chips, plus any other flavourings. Directly on top of the chips, rest your tray of ice cold water. Place the rack for your cheese above the water and, finally, your cheese on the rack. With the cheese in place, you can now apply heat to your smoke source, following the instructions supplied with your chips. This piece of kit is ideal for the job and, if I'm honest, great fun to use as well! Once you have smoke being generated, put the lid on the wok (or cover the bbq, etc) to make sure the cheese is enclosed in a dense fog of fragrant smoke. Leave for between one and two hours before removing the cheese from the smoking chamber. If your taste requires it, and you're looking for a darker finish, then up to five hours will do no harm to the cheese - provided that you keep an eye on the temperature. If you let it get above 70degrees, you risk starting to melt! However long you leave the cheese in the smoker, it will have warmed up, so let it cool back to room temperature and dry it off again before wrapping or vacuum packing. If the cheese is still quite moist, it can be returned to the fridge or cheese cave to dry for a further night before packing. Time helps bring out the flavour of smoking. So, once packed, try and resist the temptation to eat the cheese less than a week after smoking, as this will give time for the taste to impregnate the whole cheese, and the more time you give it, the mellower the taste becomes. ​Read more on general smoking equipment in this great article. One of my favourite books of all time! There is nothing in this book about smoking cheese particularly, but it has a few wonderful pages on how to smoke for preserving and flavour. My cheese making bible! If you buy no other book on making cheese, then make sure this is the one you get. There are a few pages on smoking in here, including the team smoking recipe referenced above. I haven't read this book, but it is smoking-specific and has only four- and five-star reviews on Amazon at the time of writing. So, if your interest is piqued, or you've already had a play with smoking and want to take it further, then this looks like a great buy. In a previous article, we looked at the role of starter cultures in cheese making. They are bacteria that cause the acidification of milk as we make and ripen cheese. Secondary cultures come, as the name suggests, after that, but are no less important to the cheese they are found in for the flavour, texture, aroma and general character they impart. If you’ve read many of the articles on this website, you have already learned that there are many facets of cheese making that require good control mechanisms to ensure better results, and temperature is no different.Controlling temperature is most important during the cooking and aging stages of a cheese’s life, but this article focuses on the former. Temperature control during aging is considered in the article on storing cheese.